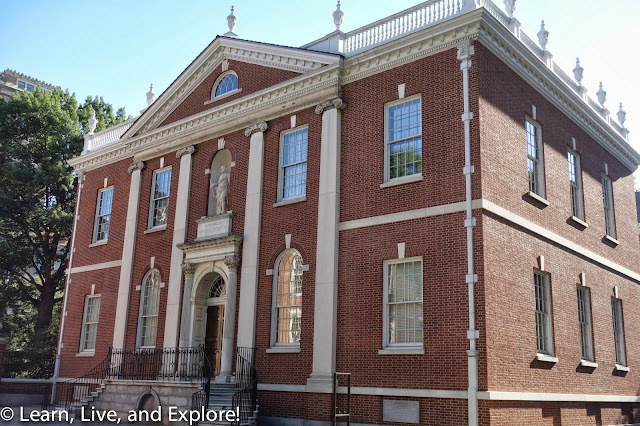 Philly in a Flash...with a side of comedy ~ Learn, Live, and Explore! What do I do when I'm in Philadelphia for just two hours? 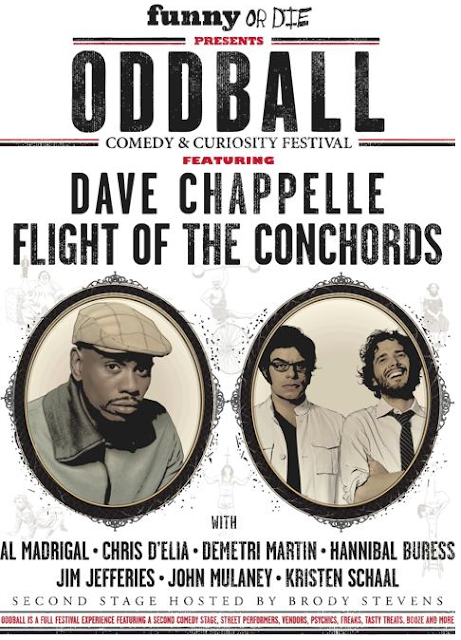 OK, two hours plus a night occupied by tickets to the Oddball Comedy Fest. 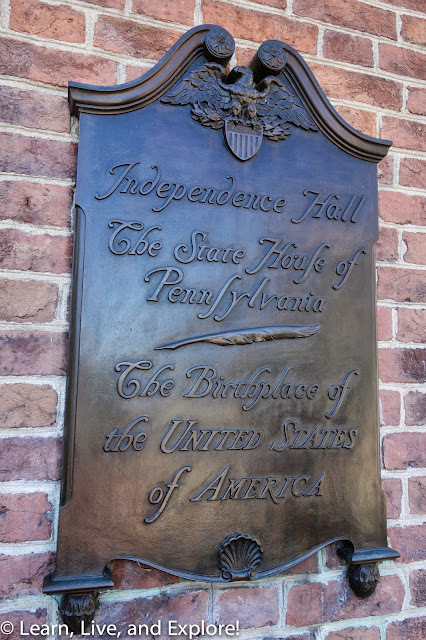 See where it all began, that's what I'm going to do...the birthplace of the United States of America! The Independence Hall area has received a very nice makeover since the last time I visited Philly. Thankfully it's not high tourist season, so I was able to get a ticket to the Park Ranger tour of the State House right away. 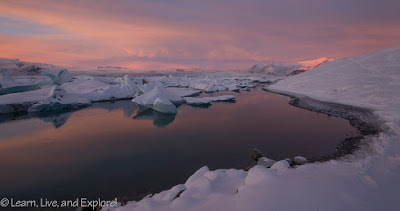 It also helps when you get up early and are there when the sites open. Tickets for the tour are free, but you can only obtain them from the ticket desk at the Visitors Center on Market Street. 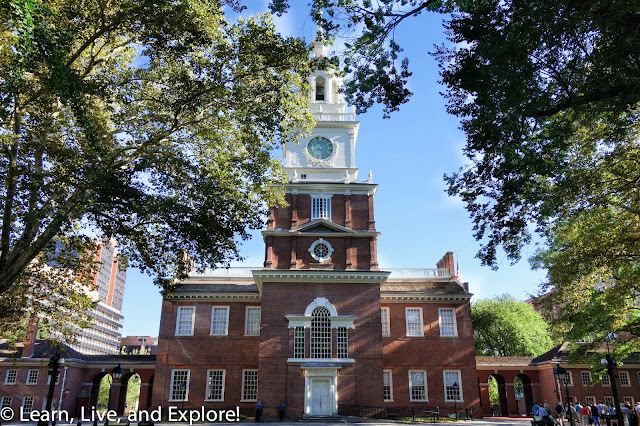 What is now called Independence Hall was known as the State House of Pennsylvania back when George Washington and his forward-thinking patriots signed the Declaration of Independence in 1776 to "form a more perfect union." 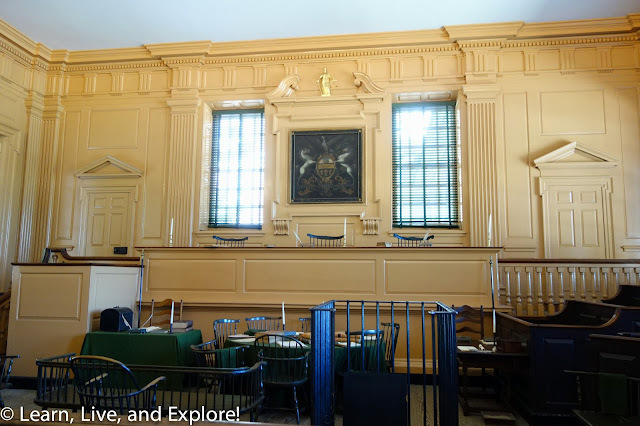 Before this momentous day, the State House was used for everyday legal proceedings in the room seen below, where the defendants literally had to stand trial. It's the room across the hall where all of the state delegates met to declare independence from the reign of the King of England. The chair at the front of the room is one of the few actual artifacts that were in the State House when the Declaration was signed. 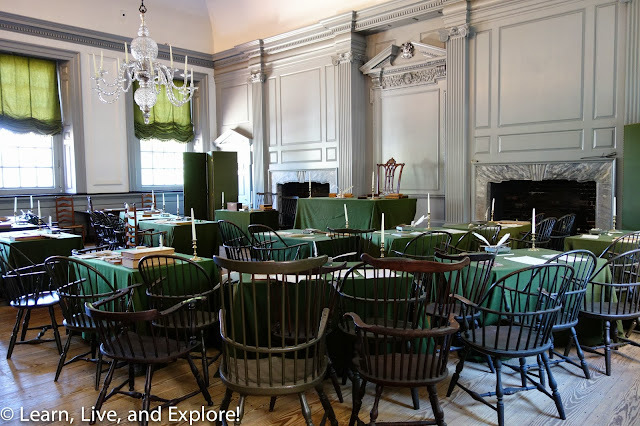 That chair was the same chair where George Washington sat. These are the discoveries that make exploring history so amazing! 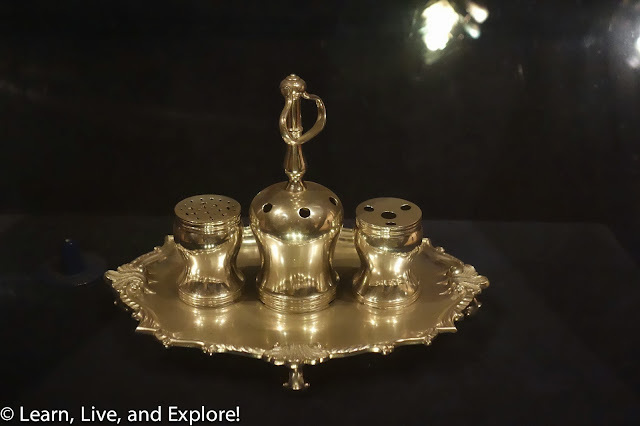 The quill and ink stand that was used for the signing of the Declaration of Independence is one of the other original artifacts from the State House. 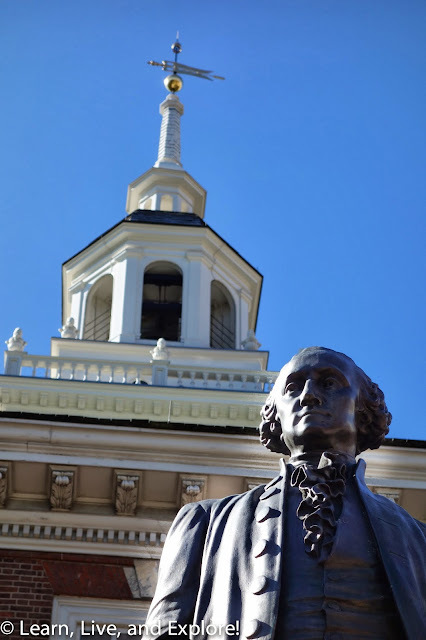 In the State House's West Wing you can view surviving copies of the Declaration of Independence, Articles of Confederation, and Constitution of the United States. The handwritten document originals are in the National Archives in Washington D.C.
Of course, no trip to Old Philly is complete without a stop at the famous cracked Liberty Bell, now housed in the Liberty Bell Center. This bell used to be in the steeple of the Pennsylvania State House and was used mostly for pretty mundane governmental announcements. 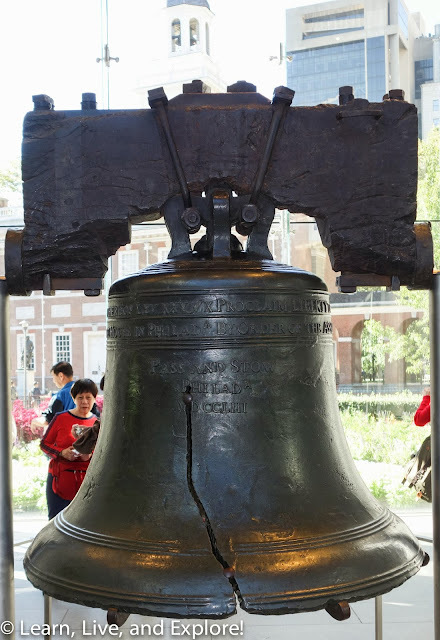 Its fame was cemented by a short story in 1847 that told of the ringing of this bell on July 4, 1776 - complete artistic license by the writer because no announcement was made of the meeting of the Second Continental Congress. The Liberty Bell may have been rung with other bells on July 8th, though, for the reading of the Declaration of Independence. As I mentioned earlier, my trip to Philadelphia was inspired by the Oddball Comedy Festival, a summer tour of some great comedic acts presented by Funny or Die. The headliners were Dave Chapelle and, my favorite, Flight of the Conchords. Event organizers were super strict about cameras and camera phones, so I'm very glad one person made the effort to record the FotC performance without getting caught and subsequently shared it on YouTube. At the same time, it was a somewhat refreshing not to feel like I should be capturing the moment in photo or video and to just let myself sit and enjoy being entertained for an hour by one of my favorite comedy acts. On which channel this show is being broadcast? and any charter spectrum reviews? or any else cable and internet services do you recommend to watch this show?